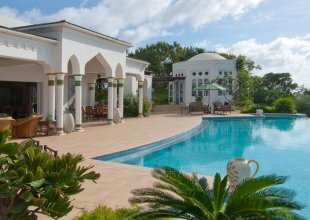 Frangipani is a seven bedroomed Caribbean 'Gingerbread' style villa situated in the very north of the island, in a hilltop location overlooking L'Ansecoy Bay. The property combines tranquillity with sophistication and elegance. 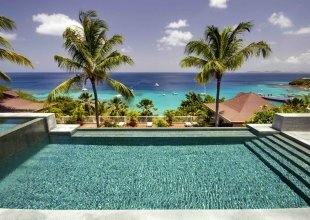 Designed by the renowned Italian architect Paolo Piva and built by the island's favourite, Arne Hasselqvist, in 1991, the property exudes colonial elegance and commands stunning views from the Caribbean Sea to the Atlantic Ocean. The interior is elegantly understated, with light, cool colours, gleaming teak wood floors throughout and crisp, white linens. The Bedrooms are luxurious: all air conditioned, each elegantly dressed, with en suite baths and showers and large ceiling fans below the exposed beam ceilings. The three children's rooms are located on the first lower level with two children's themed bathrooms with hand-stencilled ceramic mini-showers. A comfortable Library/Media Room is located off the Kitchen. The living room is enormous and opens onto a sweeping, wrap-around verandah overlooking the infinity swimming pool and the glistening turquoise waters of the Caribbean Sea. On each side of the pool is a beautifully designed Gazebo - with al fresco dining set up in one Gazebo and the other furnished for pure relaxation to fully embrace Caribbean life. N.B. i) Maximum number of guests is 10 in the 7 Bedrooms. ii) An 18% island tax is applicable to all villa rental prices.